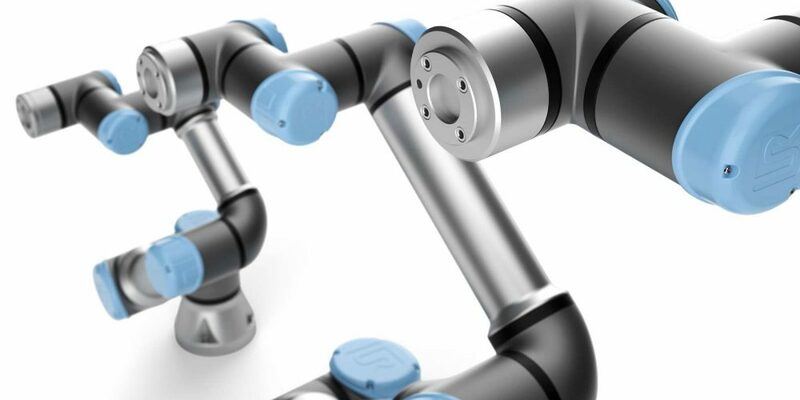 The E-Series cobots empower future-ready users with collaborative innovations, a human-centric user experience, and an ecosystem for every application, says Universal Robots. Universal Robots is continuing to evolve its ground-breaking, collaborative automation technology with the introduction of its new flagship e-Series cobots today at Automatica 2018 in Munich, Germany. This new collaborative robot platform includes technology advances that enables faster development for a wider variety of applications. Improvements include the ability to economically address even more applications, thanks to greater precision and sensitivity provided by a built-in, tool-centric force/torque sensor. Like other Universal Robots offerings, the new e-Series offers unparalleled convenience. Now, a re-designed control panel and new programming and control software make deployment and programming easier than ever – regardless of application. 17 safety functions, including customizable stopping time and distance, make collaborative automation easier. Certified by TÜV Nord, all these functions are in compliance with the EN ISO 13849-1 and EN ISO 10218-1 (Cat. 3 PLd) machinery safety standards for unobstructed human-robot collaboration. The Universal Robots president emphasized the importance of Universal Robots+ and the online training program Universal Robots Academy which will both support the e-Series platform. Universal Robots will start taking orders for the e-Series immediately, and it plans to begin shipping units to customers on Aug. 1, 2018.